Why I’m afraid of social media timelines and you should be too. We do it without thinking. On the train to work, or at home on the sofa. Sometimes even under the table at a meeting. For some of us, it’s even part of our job. The posters on your train to work keep changing in line with the items you purchased last week. An anonymous colleague keeps dropping articles on your desk. You have no idea how they know about your interest in personality tests and vegan cooking. Political canvassers representing views just a little more extreme than yours randomly appear when you’re in your favourite thrift store, or browsing through magazines at the newsagent. We all know algorithms aren’t actual people. But they might as well be, because the information they gather is sold to real companies, which use it to make you buy stuff and influence the way you think. Social media is a dream come true for advertisers. Rather than hoping a random billboard might grab your attention, they simply buy the right to find you by following your online cookie trail. And as much as we like to consider ourselves free-thinking, independent individuals, big data and advances in statistics have made our behaviour eerily easy to predict. This cringeworthy video designed to celebrate big data implies that its main advantages are to help us remember our friends’ birthdays, choose clothes and source free cupcakes. Of course there are enormous real benefits of big data – like helping to make roads safer, improve healthcare and stop the spread of diseases. But its commercial use presents a moral dilemma. As we know from economic psychology, people generally base their decisions on the information most readily available to them. It’s called the availability heuristic and as common sense would suggest, it means that we often act on the first thing that comes into our head. The first thing that comes into our head is usually the information we’ve been exposed to over and over again. Articles in our timeline which reinforce our existing worldview. Photographs similar to ones we’ve reacted strongly to in the past. Groups of people we’ve associated with before. In other words, a repetition of who we are and the experiences we’ve already had. The use of mass data sets coupled with algorithms adds a new dimension, without us even realising it. The problem with cookie-led advertising and links generated by algorithms is that they are covert. There is no one to hold accountable for them. There is no guy with a roller pasting an ad to the wall of an underground station. If we open up a print newspaper, we know that every other reader is going to see the same advertisement for a high-power vacuum cleaner on page 6. We can also reason that another publication might instead be trying to sell readers wellness retreats or flat-screen televisions. Individually tailored timelines remove that certainty and erode our biggest antidote to advertising: collective cynicism. Since the links and advertisements we’re seeing change from one second to the next, it’s impossible to develop a coherent narrative about their presentation, let alone construct a common picture of what’s happening. Sure, we could quit social media altogether. But it would be foolish to throw the baby out with the bathwater. What we really need to do is to be aware of the extent our world view is being shaped by the things people pay for us to be exposed to online. That is the first step towards reclaiming our capacity for independent thought. Five women’s blogs I check every day. For pleasure. 1. Fieldwork in Stilettos I’ve been reading Kat Richter for years. She’s a Philadelphia-based writer and dance teacher who blogs about dating, writing and lately, home improvement. Her prose is extremely fun to read. I’ve followed her through a questionable “manthropological” dating experiment, a couple of meaningful relationships and roughly the same number of heartbreaks. If you think her posts sound throwaway, check out the couple of times she’s diverged from her usual subjects – to talk about the experience of encountering anti-abortion campaigners outside a women’s clinic and, drawing from her background in anthropology, to explain why there’s no such thing as race. Whatever she writes is lively, sharp and worth following. 2. Captain Awkward When I discovered this blog, I devoured the archive in hours. Captain Awkward dispenses insightful, practical and thorough advice on subjects ranging from a woman whose otherwise wonderful partner will not accept her feminist views to anxiety about interacting with former co-workers. Written by a movie writer and director, Captain Awkward promotes mental health, we well as sexual and gender equality. The blog is also mega-successful, with each post attracting hundreds of comments. Reading is good offline too. 3. Brain Pickings This blog makes me gush. Maria Popova’s writing is exquisite, her take on philosophy, creativity and critical thinking always thought-provoking and beautifully expressed. Her essays draw on the wisdom garnered from some of the world’s greatest thinkers and how their insights might apply to our everyday lives. Her selection of quotations and suggested further reading always make me think. Read her on the boundary between hope and cynicsm and diversity and difference in children’s literature. In fact, just read everything she writes. Her site remains ad-free and funded (though I’m not sure how substantially) by readers. For me, Brain Pickings represents the very best of what the internet can do to promote independent, creative thinking. 4. 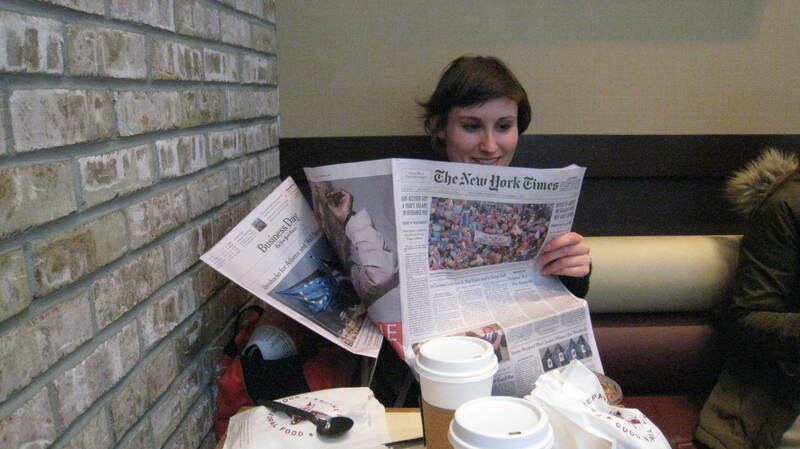 Broadside Blog Caitlin Kelly is a veteran New York journalist who turned freelance a few years ago after losing her job at a major daily paper. She posts about work, travel, the media industry, as well as friendship and family relationships. I’m attracted to her crisp, uncompromising and confident tone, as well as the many insights she has about journalism. I don’t agree with everything she says, but the way she says it is reason enough to read her work. Her writing strikes that delicate balance between personal and professional- I feel like I know her but there’s nothing I wish I didn’t know. 5. Aileen Donegan We’ve never met but know each other from our blogs and Twitter. Aileen’s a 26 year-old journalist from Ireland with an interesting background in online activism and experience living in Strasbourg. In the wake of the attacks on the Charlie Hebdo offices in Paris, she wrote a compelling piece about attending a small solidarity march in Dublin and about how that event, unlike demonstrations she’d been to in the past, sat right. I loved her recent post about the summer she spent as a teenager reading Sylvia Plath’s The Bell Jar. I’m always on the lookout for new blogs to follow, so let me know if you have any favourites I should be adding to my list! If you’re an Irish person who teaches, researches, writes or creates in an area related to language-learning, the following information sent to me by Léargas might be of interest. 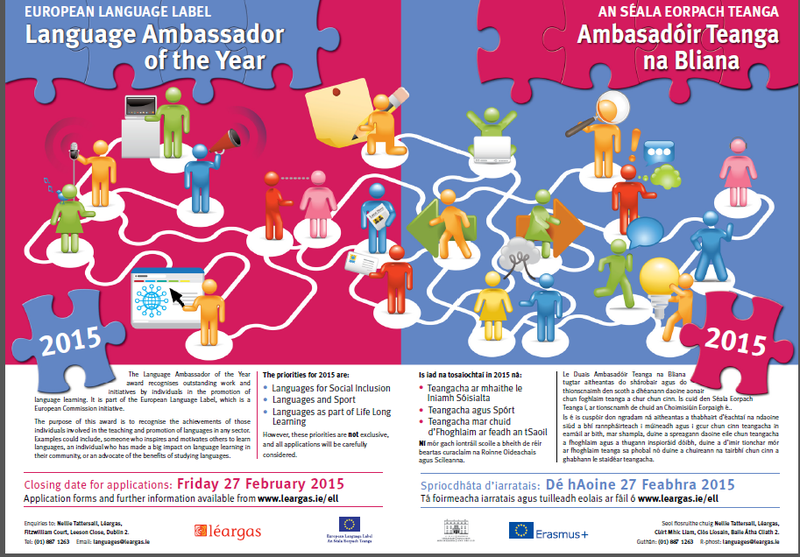 Léargas is looking for language projects and potential language ambassadors to apply for the European Language Label. It’s a languages award with two sections, projects and individuals. “Projects” can cover anything and everything, from short term to ongoing, from online to tangible and from community group to university research. Very wide-ranging, but the jury look at each and every project in its own context. This year the individual award is for “language ambassador”, the jury quite often select a number of language ambassadors rather than just one single person. The title is recognition and acknowledgement and a nice awards ceremony, it doesn’t involve any tasks. There are posters, application forms and short video clips of past winners on www.leargas.ie/ell The deadline for applications is 27 February 2015. We look forward to receiving your application!